That’s not uncharitable, just accurate, and again as a Unitarian I know all about the allure of pretentious spiritualities. 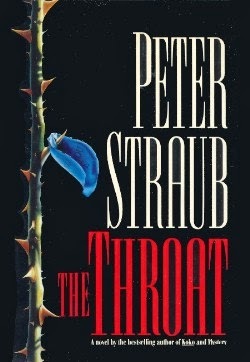 Tim Underhill is a lead character in many of Straub’s novels, and according to the author a lot like himself, so Straub could be having some fun at his own expense. That’s commendable. As I said, there’s plenty to laugh about in gnosticism. Even if John Ransom is a despicable man (as we learn at the end of the novel), he nails the gnostics pretty spot-on, like Hurtado does. That’s a perfect illustration of esoteric “mumbo jumobo” (per Hurtado) or just “making things up” (per Ransom); of emptying out real-world entities like Samaritans, priests, and levites, and pouring into the shells whatever abstractions you want. Jesus (or the early Christians, or gospel writer Luke) had been suggesting that cultural enemies (Samaritans) can be unexpected heroes. The gnostic puts us in another universe. Let me stress that I don’t bash gnosticism in favor of orthodoxy per se (that wouldn’t make me a good Unitarian). Gnosticism’s root idea is salvation by self-discovery, which I believe has solid potential. It’s the parasitic strategy that can become problematic and self-indulgent. Theological evolution is one thing, and scriptural reinterpretation, however radical, can be for the better or worse. But gnosticism was less an evolution and more a hostile takeover. In its extreme forms, the material world became an evil place, the human body an evil vessel. The Hebrew scriptures praised an evil demigod, and Jesus became the remedy for this (badly perceived) problem. His sayings were interiorized to provide an inner escape route — most of which, frankly, are obtuse spiritualizations masking as superior theology.